the building on the left and the Retail Store is on the right. Is your schedule so hectic that you can't attend a four-week cake decorating class, but you still want to learn some of the basic techniques? This is your class. In this class we will learn many of the same techniques taught in our Comprehensive Cake Decorating Class and some shortcut techniques so that you'll be able to decorate cakes to impress your family and friends. We'll show you how to torte and fill your cake layers with fruit filling, and then ice the cake smoothly to give you the perfect decorating surface. You'll learn some simple borders, drop flowers, rosettes, dots and a ribbon rose. You'll go home with a completely decorated cake and a tool kit so that you can continue decorating cakes at home. This class is for adults (ages 12 & older). If you have a budding pastry chef younger than 12 who wishes to attend this class they will need to be accompanied by a registered adult. 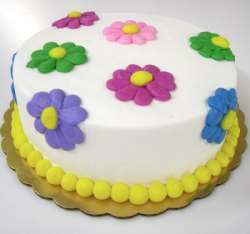 We will provide the cake and icing and you'll use your tool kit, along with our classroom tools, to decorate your cake. We will provide a box for you to transport your finished cake home after class. You'll go home with a completed cake, recipes and instructions, and your tool kit (included with class) so you can continue decorating at home using the techniques learned in class. You will receive a discount coupon good for 50% off your next class. You may want to bring an apron to protect your clothing.